An outdoor furniture is a great option if you want to embellish your space, but still stay practical. And if you’re a fan of DIY projects, that’s even better. That’s why today we are going to have a look at some funky, yet practical outdoor furniture ideas you can try out in 2018. If you have some old pallets lying around, it’s a good idea to repurpose them. Go to the store and buy some funky paint. If you already have some lying around, that’s even better. Get some wooden pallets and paint them in crazy colors. You can choose just one color if you want to, but it’s recommended you play around with them. Paint one wooden board green, the other pink, the other blue, and so on. Make sure it’s as varied as possible. Then, set them up as a dining table in your backyard. Just make sure that it’s safely set and there is no danger of accidents. Not many people have an ice chest in their backyards, which makes it a great idea. It’s even better if you already have some reclaimed wood around your home. Craft a regular chest and set up a plastic interior. If you don’t make sure there is a barrier between the ice and the wood, the material might be affected in time by all the humidity. A cool idea is to add a bottle opener to the side. In this way, you can enjoy a cold beverage all summer long in the comfort of your own backyard. 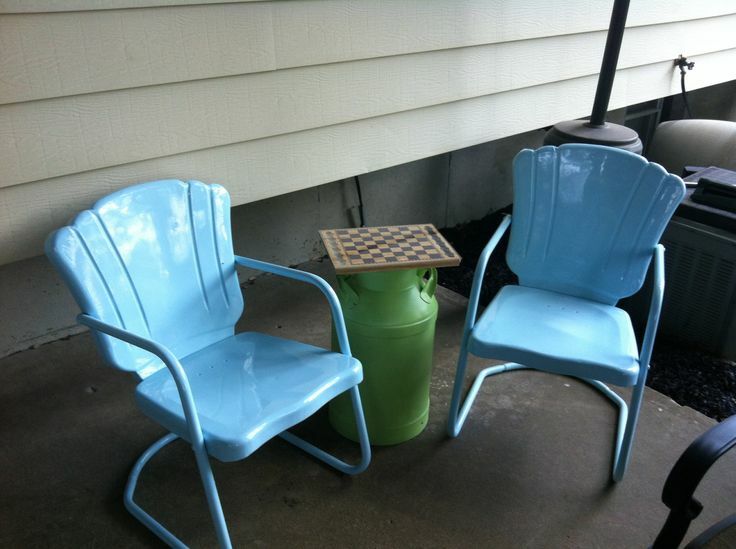 You can also turn this into one of the most creative and funky outdoor furniture ideas if you color it in bright colors. 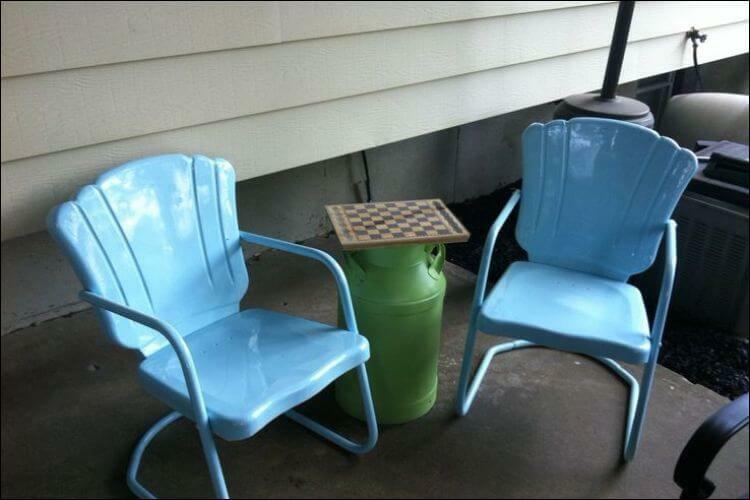 Another one of the practical outdoor furniture ideas is to turn an old milk jug into a cheap table in a farmhouse style. This goes perfectly with a rural setting or a similar style in your backyard design. If you already know how to build outdoor furniture, then you must be familiar with setting a wooden board on top of other items. This will be the case here as well since you need to set the wooden surface on top of the milk jug. The size depends on the milk jug you have and how big you want your table to be. It’s important to pay attention here to the stability of the table. Don’t place a large wooden board on a narrow milk jug mouth. Otherwise, you may injure yourself or other people when using the table. For this, you will need a couple of crates, two long wooden boards, bolts, and short wooden pieces. Paint the crates in crazy colors and bolt them together. Attach them to the long wooden boards placed above and under them. A good suggestion is to paint the crates red and the top and bottom planks in a different color, such as black. It contrasts nicely if you have a brick décor, but it can fit almost anywhere. Once again, it’s important to pay attention to the safety aspects. Crates tend to be quite narrow, so make sure the bench is strong enough to hold several people, for example. If you already have an outdoor home theater, then most likely you also need some seating. Quit the old chairs and armchairs and go for a crazy idea. For this, you will need two plywood sheets in equal size. Paint them in a bright color, such as bright green to match your lawn. Use hinges to keep the two sheets together and to be able to fold them away. Add some cushions on one side and your movie night is ready! Keep in mind that in this case, the cushions will stay on the ground as well. If you want to avoid this, you need to add a third plywood sheet for the seat. 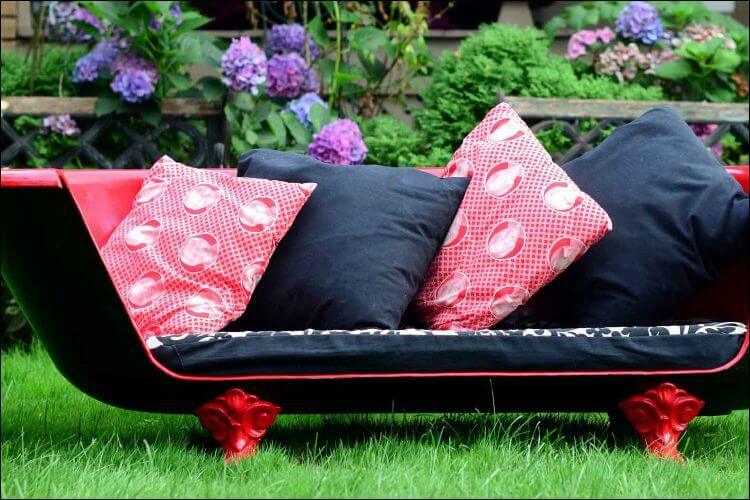 Recycling is a great resource for when you want to try some cool outdoor furniture ideas. Another suggestion we have is to use a cast iron bathtub and turn it into a sofa. Naturally, for this you will need an old cast iron bathtub (or a new one if you want). Add some foam and fabric to the shopping list as well. Cutting the tub may be the most difficult part here, but luckily you need to take off just one side of it. Then, you need to cut the foam in the shape of the tub. Place the foam on the bottom of the new sofa and wrap it in colored fabric. Then, you can add anything you want to make it as comfortable and original as possible: cushions, decorations, a side table, etc. Another good idea is to create your own pergola with scrap wood. This is one of the best outdoor furniture ideas which you can craft yourself. However, make sure you are using strong, quality wood. 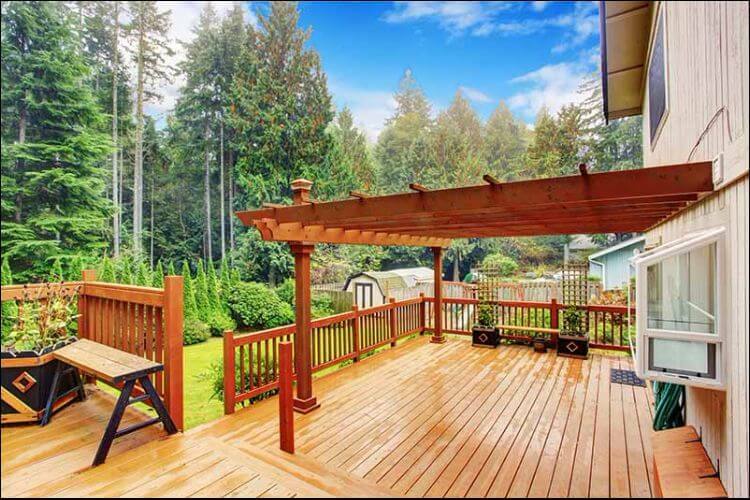 A pergola is usually rather big, so you wouldn’t want it to collapse. The dimensions are entirely up to you, but usually such a construction is quite large. This project is one of the more complicated ones since you might need to rent extra equipment to handle large pieces of wood, to cut them, etc. The funky part comes only after you build the main structure. Decorate it with pieces of paper, glitter, colored cardboard, and anything you have colored around the house. If you have children, it’s even better to ask for their help. Even though the result might turn out a little funky, the pergola will be the main attraction of your space. 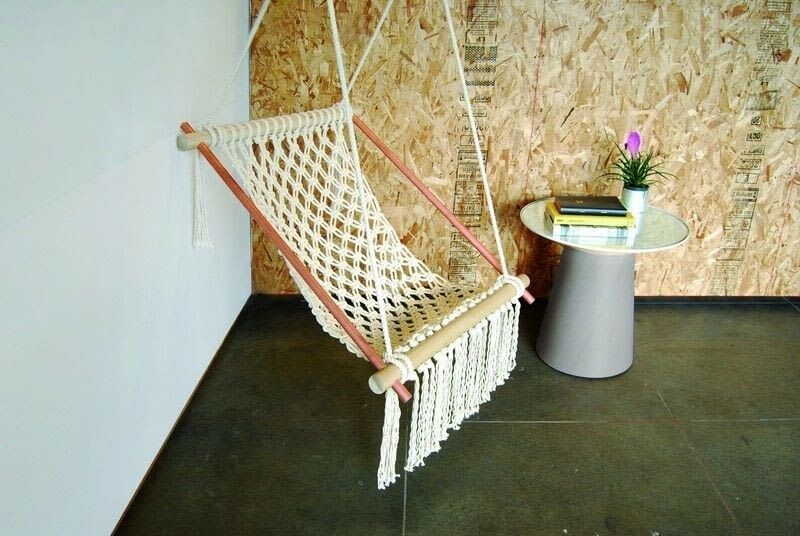 If you want to relax on your porch or in the backyard, a macramé hammock is a great idea. This is one of the outdoor furniture ideas where you can ask for help from your grandma or an aunt who likes to knit or to craft things. The macramé technique consists of knotting together various cords. As you’re probably accustomed by now, we would recommend you use cords in different colors. Even though today it’s not such a popular technique, macramé has been used for centuries to craft plant holders, furniture, and other home décor items. 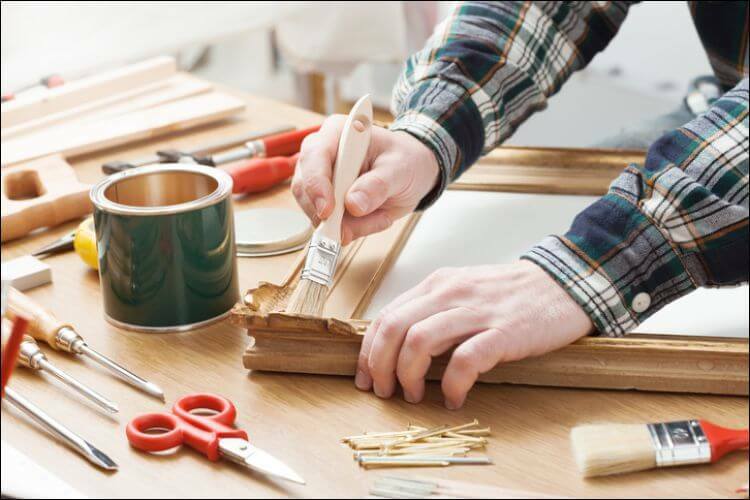 Make the frame by using dowels with holes at the end. 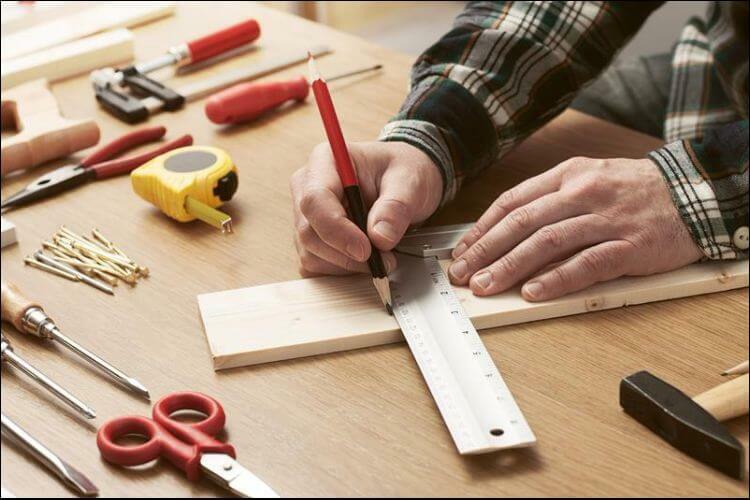 Slide small dowels into bigger ones, but make sure you leave 1-inch overlap at the ends. Secure them with a 1-inch screw, then hang the frame somewhere and start wrapping the cords. Keep in mind that the cord will shorten quickly as you knot, so you will need to get plenty of material. When your macramé reaches the necessary length (around 45 inches), tie it to the other end of the frame. Add a string through the ends of the hammock to secure it and you’re set. Redecorating your home is a great opportunity to take advantage of the materials you have lying around. An old door, for example, can be turned into a stylish, funky outdoor table. First, you will need to measure the door to adjust the other components correctly. Include here any overhang you wish for your table. Depending on the looks of your door, you may want to spray paint it before or cover it up with some plywood sheets. You can simply place the door on four legs and secure it with bolts, or just place it on top of a regular table. You will also need a sheet of glass to place above it. In this way, you make sure you have a smooth surface to eat, write, or play on. Some rubber stoppers are great to place on one side of the glass if you want to make sure the door stays in place and there is no moisture trapped underneath. Now you just need to call your friends and spend a lovely evening around your new (old) table. 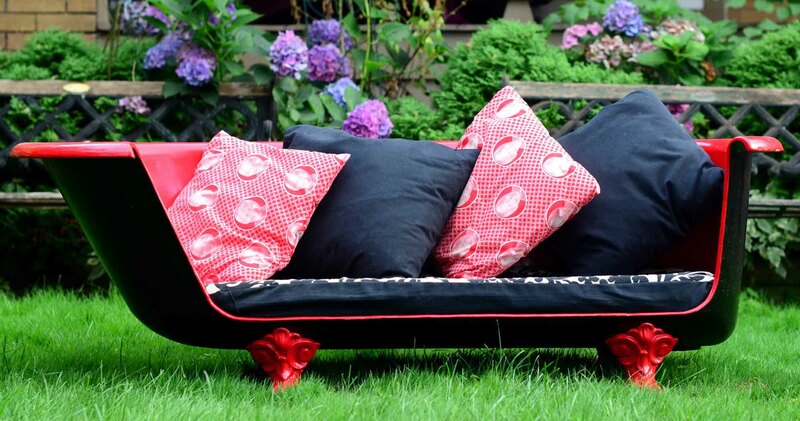 One of the most original and crafty outdoor furniture ideas is to recycle car tires and turn them into ottomans for your patio. First, you need to measure the tire and cut a wooden board the same size. Sand the wood well, then paint the tire in the colors you want. Make sure it is covered evenly. It is recommended to apply a primer first, to make sure the tire doesn’t crack. The wooden board should stand as a cover for the bottom of the tire. Separately, take a cushion and wrap it in a colorful material. Depending on the size of it, you can simply place it inside the tire, if it’s tall enough to go over the brim. If not, you can stack together various cushions, or just glue one at the top. These outdoor furniture ideas may seem a little crazy, but they are very practical. Besides testing your crafting abilities, they are also useful for decorating your backyard and saving money. Whatever idea you choose, make sure it’s safe to use and no accidents will appear.